The National Biodiesel Board recognized three organizations in California this year as the Eye on Biodiesel Climate Leader award winners. 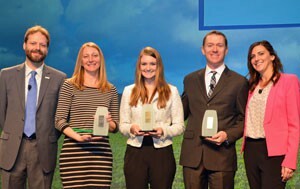 The Environmental Defense Fund (EDF); Environmental Entrepreneurs (E2); and the American Lung Association were all recognized for their environmental leadership to promote all clean fuels, including biodiesel, along the West Coast. These three organizations, along with other NGOs, bolstered and defended Low Carbon Fuel policies in California and Oregon. NBB Director of Sustainability Don Scott (L) presented the awards to representatives each organization – Mary Solecki of E2, Heather Palmer with the American Lung Association, and EDF’s Timothy J. O’Connor.